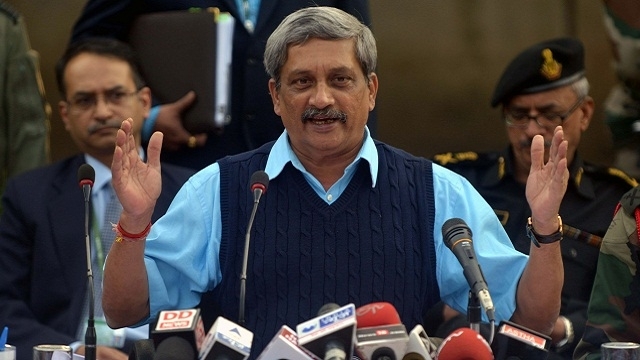 Defence Minister Manohar Parrikar has warned enemies without naming any country. Minister on Monday said in Army Day Celebration, "If someone hurts you, he also understands the same language; that he does not know his conduct, until you have the same pain warrant felt him." Parikar said: it is my personal opinion, not of government. I am always believed, 'if someone harms the country, the pain of harm must have that person or organization realized.' how, when and where has to realize him this feeling, we will determine the place. If your pains don’t have him realized, he will be repeating such act. Parikar paying homage to the martyrs, said, “Martyrdom has always high image, but the country needs to kill the enemies. We have the pride of 7 personnel who have become martyrs, but why did my arm personnel become martyr is also a painful for us? They fought bravely; the air force and army have grown the image of country, he said. When asked about the meaning of this statement, he said, “The history tells, 'whoever breaks you; if they do not know how much pain you have got..., they cannot change themselves? '” 7 Indian security personnel have become martyrs during the terror attack at air force base in Pathankot. India has given its evidences that the terror attack was organized in Pak. The suspected persons were arrested after double pressure on Pakistan. A few suspects are in custody and they are being questioned on the basis of phone numbers assigned by India.